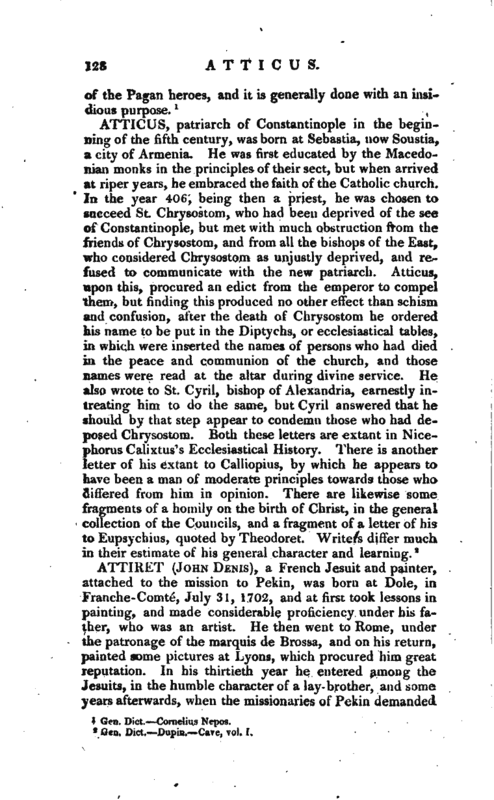 , was a celebrated Roman knight, to whom Cicero wrote a great number of letters, which contain the general history of the times. 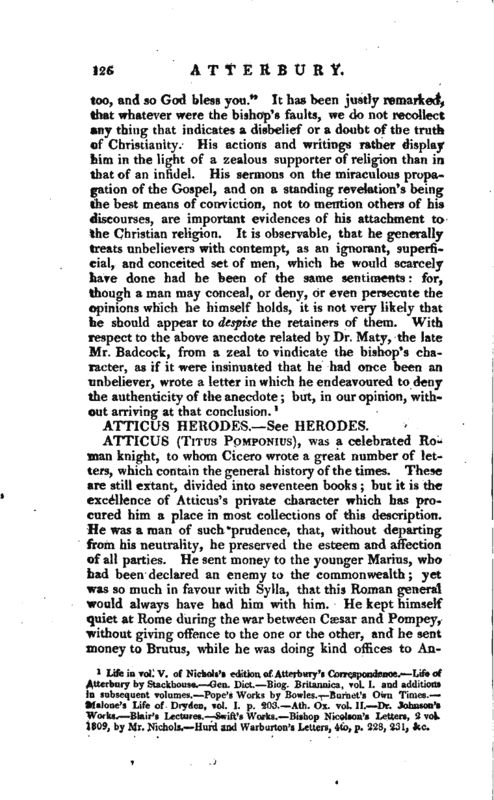 These are still extant, divided into seventeen books but it is the excellence of Atticus’s private character which has procured him a place in most collections of this description. He was a man of such prudence, that, without departing from his neutrality, he preserved the esteem and affection of all parties. He sent money to the younger Marius, who had been declared an enemy to the commonwealth yet was so much in favour with Sylla, that this Roman general would always have had him with him. He kept himself quiet at Rome during the war between Caesar and Pompey, without giving offence to the one or the other, and he sent money to Brutus, while he was doing kind offices to | An­%ony. Afterwards, in the cruel divisions which arose between Antony and Augustus, he contrived to preserve the friendship of both, difficult as it must have been in the case of two such antagonists. The strict friendship he had with Cicero., did not hinder him from being intimate with Hortensius and he was the cause (as Nepos, his biographer, tells us) that these two rivals not only ceased from mutual reproaches, but even lived together upon very good terms. The contests between the parties of Cinna and Marius induced him to go to Athens young, where he continued a long time, and became such a favourite with the Athenians, that the day he left them was a day of mourning. He never attempted to raise himself above the rank of life in which he was born, which was that of knight, although he might have obtained the highest posts in the republic but he chose to renounce all pretensions to them, because, in the then prevailing corruption, he could neither gain nor discharge them according to the laws, and as a man of integrity; no inconsiderable proof of his virtue, notwithstanding he has been charged with avarice and political duplicity. He did not marry till he was fifty-three, and had only a daughter, who was married to Agrippa from which marriage came a daughter, whom Augustus betrothed to Tiberius almost as soon as she was born. 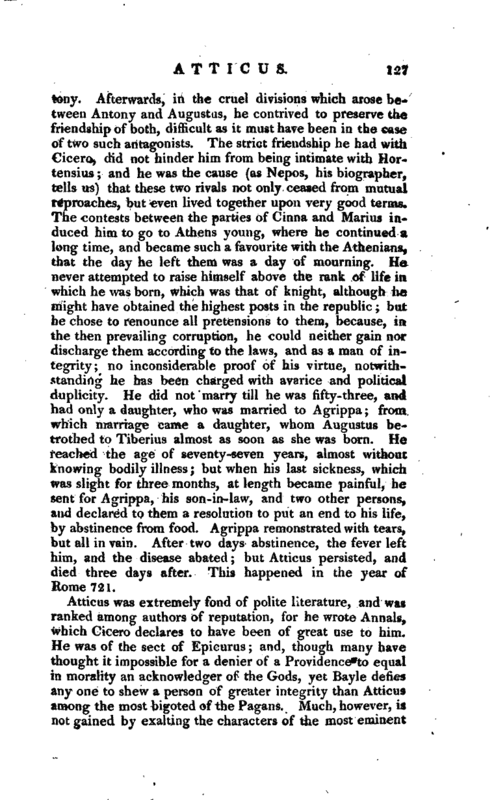 He reached the age of seventy-seven years, almost without knowing bodily illness but when his last sickness, which was slight for three months, at length became painful, he sent for Agrippa, his son-in-law, and two other persons, and declared to them a resolution to put an end to his life, by abstinence from food. Agrippa remonstrated with tears, but all in vain. After two days abstinence, the fever left him, and the disease abated but Atticus persisted, and died three days after. This happened in the year of Rome 721.